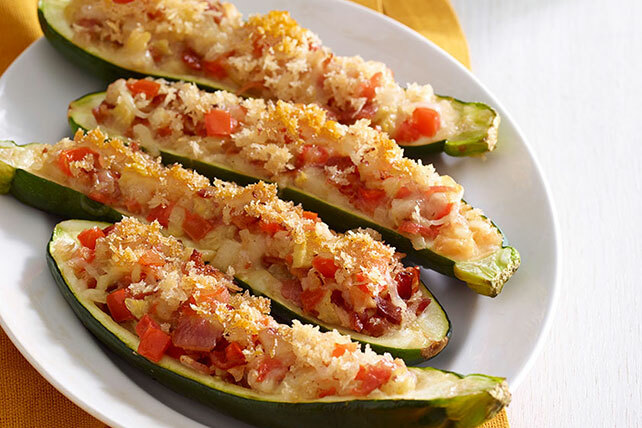 Fill this Stuffed Zucchini with tomatoes, onions, bacon & cheese. Then, top the Stuffed Zucchini with golden-brown panko crumbs to add even more flavor. Chop zucchini flesh. Melt 1 Tbsp. butter in large skillet on medium-high heat. Add onions and chopped zucchini; cook and stir 3 min. or until onions are crisp-tender. Add tomatoes and bacon; cook 2 min. Stir in cheese. Spoon into zucchini shells. Melt remaining butter in same skillet. Add panko crumbs; cook and stir 3 min. or until golden brown. Sprinkle over filled shells. Serve this vegetable-based side dish with a serving of lean meat or poultry. Substitute 2 sliced green onions for the chopped yellow onions.